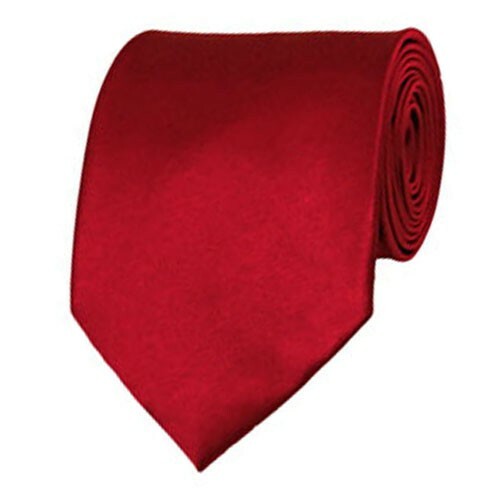 Our crimson red solid colored neckties have proven popular with schools, choirs, sports teams, embroiderers and individuals looking for a basic tie at a discounted price. Sporting a luxurious satin finish with just the right amount of sheen, our solid black 3 and 1/2 inch necktie features a full lining to provide superior body & feel to the necktie, allowing it to make excellent knots and last for years of service. Most orders ship within 2 business days. Express shipping available. Shop worry free with our risk free 30 day return/exchange policy. Color matching solid color neckties can often be a challenge. Below you'll find a compilation of tie matching guidelines and tips that we have put together to help. The bottom line is that despite our best efforts at making sure the colors you seen on your screen are accurate, there is still no substitute to seeing the actual fabric in person. If you are still left concerned about a color, please give us a call - we'd be happy to help! The colors on your screen - We've put a lot of effort in making sure our pictures match our products as accurately as possible. We color match each tie on our in house computer screens until it is an exact match. That said, unfortunately we cannot guarantee that the colors you are seeing are the same. Due to variations in technology, brands and settings of computer monitors and mobile devices, the colors you see on your screen may not be a totally accurate reproduction of the actual product and should only be considered a guide. Color Names - Unfortunately identical color names do not necessary mean your colors will match. Each designer or brand has their own special cocktail dye mix for creating their various colors and is free to name them whatever they want. Dress designers in particular, do this so that you have to buy all of your accessories from them. Unfortunately it often makes matching ties super challenging. If your dress supplier is dying other accessories, we do offer blank white ties which can be dyed to match. Material - Our solid color ties are satin finished and like all satin finished items, the exact brightness that is displayed at any given moment varies greatly depending on the amount, type and angle of the lighting, adding yet another variable. We try to provide multiple pictures in hopes of showing all of the ranges of color that can be seen on the tie, please remember different display devices can display these shades differently. Dye Lots - Yes! Ties have dye lots, which can sometimes make for extremely small differences in the shades of our ties. When ordering multiple ties from us on one order, we will always send ties from the same dye lot. That said, we ship out a lot of ties - if you order again from us in a few weeks, it is possible you might get ties from a different dye lot. Chances it won't be noticeable, but if you want to play it safe order all of your ties at once and we will make sure they are all exactly the same. Matching formal dresses - for weddings, proms and other events. When the ties arrive, the best way to check the match is not to lay one of the ties over the dress as you might expect - that will just show how different they are - don't do that!. Lay one of the dresses on a bed or couch, then put together an outfit of what the groomsmen or your date would be wearing right next to it. Slip the tie into the outfit, then step back a few yards and take a look. That is the closest most people will be seeing the couple and it will help you by seeing the match from that perspective. Most dress manufacturers make up their own cocktail colors, ones that might not be made by any other company, to ensure you purchase all of your accessories through them. Unfortunately, they often forget men's ties. Following the above tips will often help you find the closest matching tie for your needs. If the color you purchase is not the correct shade, or if you need the ties in a rush and order multiple colors, we offer an easy 30 day return/exchange policy. Do you need matching ties and accessories in different sizes or styles? All related items listed on this page will be an exact match to this item.